We are engaged in offering Sports Flooring Service to our client. (Neoflor 4010) Neoflor 4010 is a free flowing, self levelling material, specially designed for easy application over concrete floors as a stand-alone topping. It is ideally suited for tennis and badminton courts, museums, multiplexes & etc, . Neoflor 4010 is a free flowing, self levelling material, specially designed for easy application over concrete floors as a stand-alone topping. 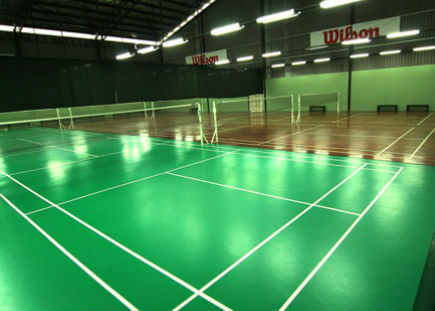 It is ideally suited for tennis and badminton courts, museums, multiplexes & etc,. Prism Coating Solutions has carved a niche amongst the most dominant names in the market and incorporated in the year 2012 as a Sole Proprietorship based firm. The headquarter of our corporation is located at Bengaluru. We are dedicatedly involved in wholesaler & trader Epoxy Flooring, Polyurethane Floor Coating, Self Leveling Cementitious Underlayments and Hygienic PU Wall Coating etc. We are service provider of Epoxy Coving Service & Flooring Serives etc.